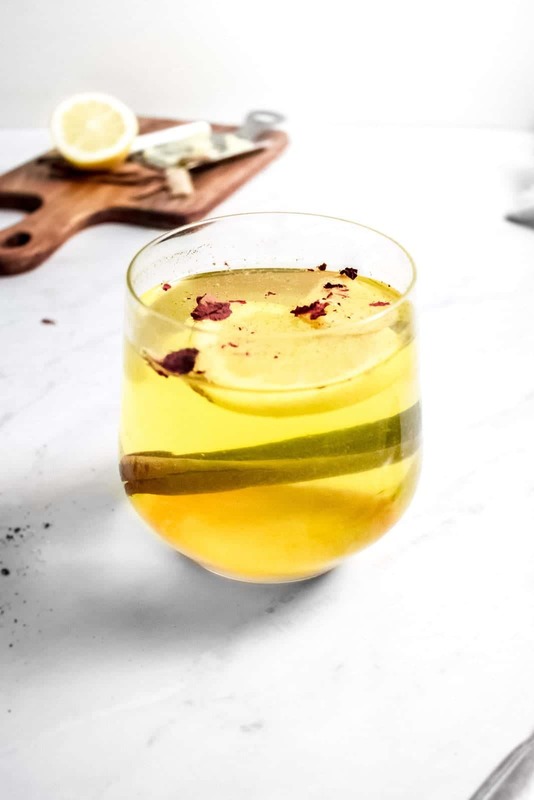 This Ayurvedic Ginger & Turmeric Tea will give you the chance to sit down and unwind. It’s essentially a sunshine in a cup. Golden turmeric will provide tons of health benefits, while pungent ginger will leave you feeling fresh and rejuvenated. 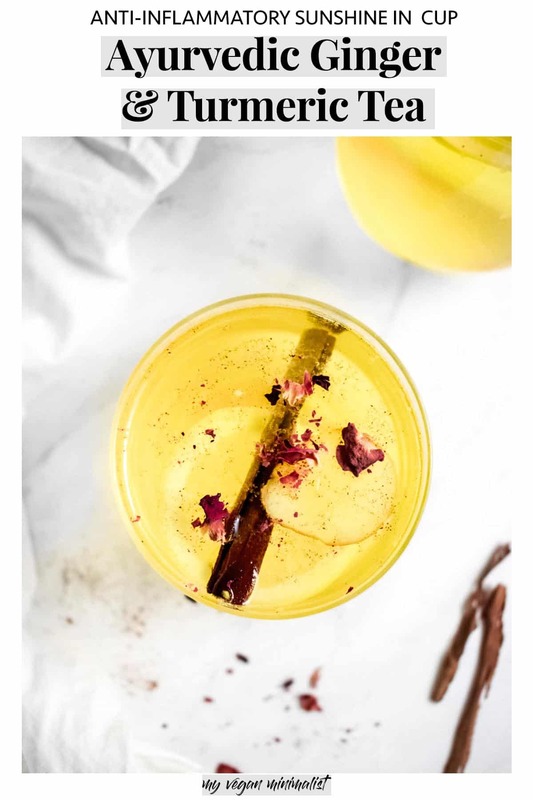 Read why this ginger & turmeric tea is one of my absolute favourite healthy drinks. Ginger, Turmeric and Cinnamon – Goodbye Inflammation! Turmeric is known to be an effective anti-inflammatory herb. It contains curcumin, a powerful medicinal compound with antioxidant & anti-inflammatory properties. Ginger and cinnamon play a crucial role too. 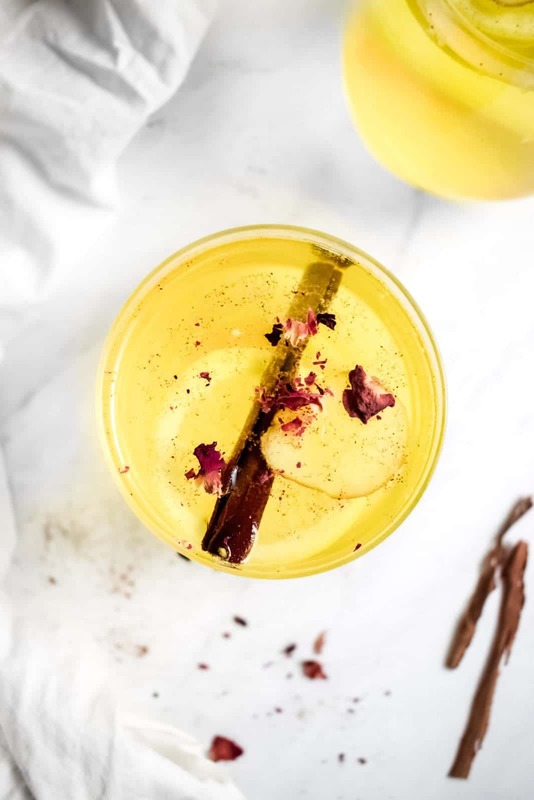 Not only is ginger rich in vitamins and minerals, it also contains potent anti-inflammatory compounds (with an incredibly cute name – gingerols). Last but not least, cinnamon can help reduce blood pressure and improve blood sugar levels. I’m not claiming that veganism has in any way made me cold-resistant. However, ever since switching to a fully vegan diet, I’ve hardly ever suffered from a cold. 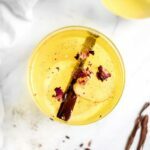 Throughout most of the winter and well into the spring, I love to rely on this Ayurvedic ginger & turmeric tea. It never fails to give me a much-needed boost of vitamins and helps me breathe more easily. I love making this super healthy tea in the early morning to kick start my day like royalty. I’ve also noticed it somehow helps me act a little bit less moody in early mornings, which is a miracle by itself (like I would literally only drink it for that!). Love healthy drinks? Make sure to check out my rose and raspberry smoothie with coconut or my incredibly simple spiced fruit tea. This recipe suggests you use the purest form of cinnamon – Ceylon cinnamon. How does Ceylon cinnamon differ and why is it better than ‘normal’ cinnamon (cassia cinnamon)? Well, you’ve come to the right place. I’m literally obsessed with cinnamon and whilst I’m in no way a diet specialist, I have done tons of research online and offline to learn about Ceylon cinnamon and its benefits. The main difference? Cassia contains a compound called coumarin, which is known to cause liver, kidney and lung damage in large doses. Of course, this is not a problem if you’re enjoying just a little bit of cinnamon here and there. However, keep in mind it only takes between 1 and 2 teaspoons to exceed your safe daily limit of coumarin. And if you’re a cinnamon lover like me, you will know that 2 teaspoons of cinnamon is actullally not a lot at all. The solution? Go for Ceylon cinnamon, which is free from coumarin! Want to learn more? Check out why not all cinnamon is created equal. Slice 1 thumb of fresh ginger into small cubes and place in a pan. Add turmeric powder and a pinch of black pepper. Add 2 cups of water, bring to the boil and simmer for 5 minutes. Remove from heat and strain the ginger using a sieve to get rid of any large pieces. Add a squeeze of lemon to each cup. Sprinkle with Ceylon cinnamon and enjoy warm. Optional: add sweetener of choice (agave syrup etc) and top off with dried rose petals.